Are you a UFO buff, paranormal fan, or someone with an interest in the strange lights seen in the skies for millennia? Check out Contact in the Desert! 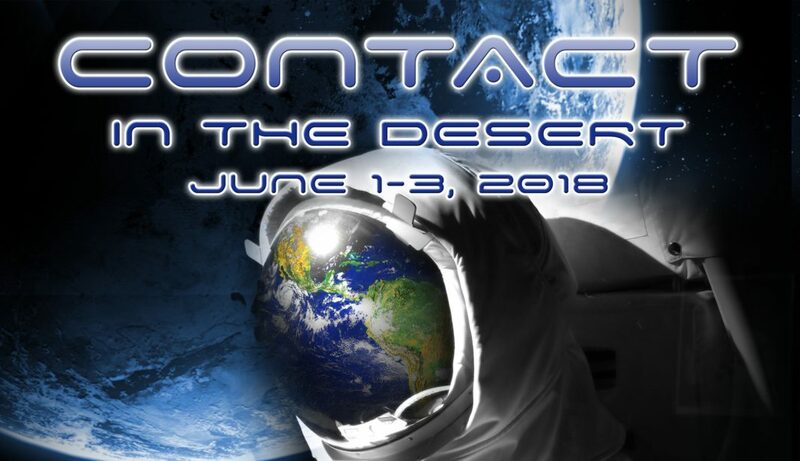 Contact in the Desert (http://www.contactinthedesert.com/) is the largest UFO conference of its kind, expecting some 3,000+ attendees and a boatload of famous speakers. It’s June 1 – 3 in Indian Wells, California and Nerdbot will be attendance. With the news that the US government was keeping track of UFOs, the headlines from Tom DeLonge, and the popularity of the ancient aliens idea, this should be an interesting event for skeptics, true believers, and everyone in between! Check out the press release below and let Nerdbot know if you want to see more UFO news in the comments! PRESS RELEASE: Interest in Contact in the Desert, the largest UFO conference in the world, is surging due to a recent story in the New York Times detailing some of the findings of a “mysterious UFO program,” that included video of a Navy F/A-18 Super Hornet encountering an unknown flying object. The video was released by the Defense Department’s Advanced Aerospace Threat Identification Program, an initiative funded from 2007 to 2012 by then Senate majority leader Harry Reid. The article details a 22 million-dollar program hidden deep within the Pentagon budget with the expressed intent “to investigate aerial threats,” including what the military preferred to call “unidentified aerial phenomena” or simply “objects.” The story explains that this is big news as the United States military had announced in 1969 that UFOs were not worth studying. CONTACT in the DESERT is set to hold its 6th annual event at a new location, the Renaissance Resort and Hotel in Indian Wells, California. The conference launch to begin on June 1 – 4, will bring together an all-star team of experts to discuss the latest developments in the field, including the recently disclosed secret Pentagon UFO program. 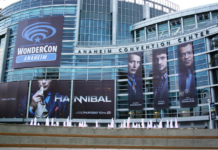 More than a conference the event is a portal through which attendees can gain knowledge and the most up-to-date info on UFOs and ancient alien studies. Close to 100 people attending the annual CONTACT in the DESERT event in 2016 witnessed several UFOs at close range. This might have been dismissed as anecdotal except that a documentary film crew captured the incident. Reportage and video of the sighting was covered in the Daily Express, Coast to Coast AM, and other outlets. Also in 2016, in Indian Wells, the conferences’ new home, dozens of bright star-like orbs moving together rapidly across the sky, were observed on July 23. Will there be a sighting at this new location for the event’s 6th year? 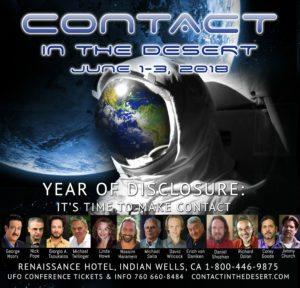 CONTACT in the DESERT features the strongest speaker lineup ever assembled in the UFO field, from FBI, NASA, military, and government officials, to ancient alien researchers and scientists, as well as archeologists and cosmologists. Expected speakers include CONTACT IN the DESERT returnees Chariots of the Gods author Erich von Daniken; Ancient Aliens star Giorgio A. Tsoukalos; George Noory host of Coast to Coast AM; South African researcher Michael Tellinger; Pentagon Papers/Watergate/Silkwood lawyer Daniel Sheehan; British Government Ministry of Defense specialist Nick Pope, and best-selling author/screenwriter of the Communion series and film, Whitley Strieber. New, highly anticipated speakers for 2018 include two-term Utah Congressman Merrill Cook, bestselling author and popular speaker Freddy Silva, and Secret Space Program veteran Corey Goode. 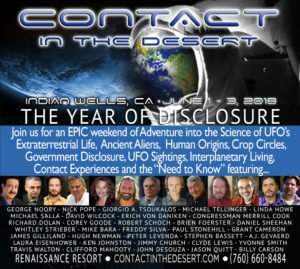 Presented as a serious investigation, CONTACT in the DESERT’s powerful weekend lineup of leading UFO and Ancient Aliens speakers will also feature Linda Moulton Howe, David Wilcock, Robert Schoch, Michael Salla, Jacques Vallee, Richard Dolan, Mike Bara, Nassim Haramein, Richard Cassaro, Paul Stonehill, James Gilliland, Stephen Bassett, Grant Cameron, Hugh Newman, Peter Levenda, Laura Eisenhower, Jimmy Church, Clyde Lewis, Yvonne Smith, Brian Foerster, John Desouza, Clifford Mahooty, JJ and Desiree Hurtac, Carl Lehrbuger, Jeremy Corbell, Joel “Doc” Wallach, Sasha and Janet Lessin, Steve Murillo, and many more. In addition to the panels, lectures, meet and greets, film screenings, special events, included with a weekend pass, attendees are also able to purchase tickets for more than 30 workshops presented by top UFO experts, including David Wilcock, Erich von Däniken, Giorgio A. Tsoukalos, Michael Tellinger, Michael Salla, Jacques Valle, Linda Moulton-Howe and Richard Dolan. Night vision and fieldwork experiences will be available, and on Monday June 4th, thirteen of the presenters will each offer a three-hour intensive on their area of expertise. The Renaissance Indian Wells Resort & Spa is the perfect setting for CONTACT in the DESERT. Set against the backdrop of the beautiful Coachella Valley, the resort is a restful sanctuary for weekend getaways and family vacations and offers a variety of meal-plan options right on site. On-site accommodations are nearly sold out, but plenty of nearby hotels in Indian Wells, Palm Desert, and Palm Springs offer special rates for attendees. Early-bird tickets for the event are $225 ($410 per couple) until March 14th. After that, advanced tickets are $250 ($450 per couple). Tickets and workshop passes are available at http://contactinthedesert.com/tickets/passes/. For public information please go to www.contactinthedesert.com, or call 760 660-8484. For press information, please contact Susan von Seggern on 213-840-0077, or susan@susanvonseggern.com.